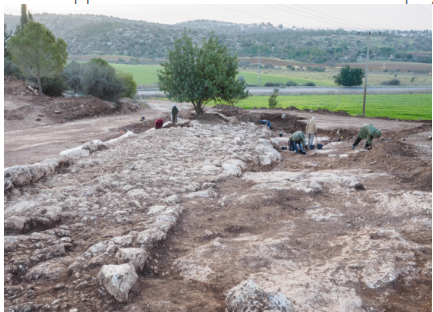 A wide and impressive 2,000 year old road dating to the Roman period, in an extraordinary state of preservation, was revealed last February in archaeological excavations of the Israel Antiquities Authority near Highway 375. The excavation was conducted prior to laying a water pipeline to Jerusalem, at the initiative of, the Bet Shemesh water corporation “Mei Shemesh”. Students from “Ulpanat Amit Noga” in Ramat Bet Shemesh volunteered to participate in the dig. According to Irina Zilberbod, director of the excavation on behalf of the Israel Antiquities Authority, “The road that we discovered, which 2,000 years ago passed along a route similar to Highway 375 today, was up to 6 meters wide, continued for a distance of approximately 1.5 kilometers, and was apparently meant to link the Roman settlement that existed in the vicinity of Beit Natif with the main highway known as the “Emperor’s Road”. That road was in fact a main artery that connected the large settlements of Eleutheropolis (Bet Guvrin) and Jerusalem. The construction of the Emperor’s Road is thought to have taken place at the time of Emperor Hadrian’s visit to the country, circa 130 CE, or slightly thereafter, during the suppression of the Bar Kokhba revolt in 132-135 CE”. The presence of a milestone (a stone marking distances) bearing the name of the emperor Hadrian which was discovered in the past close to the road reinforces this hypothesis.